The Patriots earned a first-round bye in the playoffs, a valuable week off that will let the players rest their legs and the coordinators schedule their job interviews. 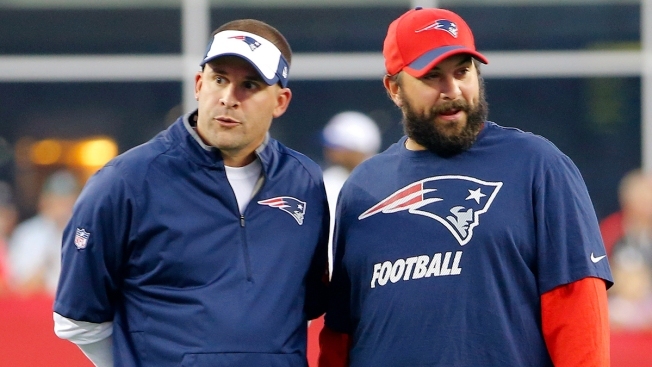 Josh McDaniels and Matt Patricia have been considered among the best minds in football for a while now. The jobs they're doing this season, their latest gems came in a 16-3 victory over the Broncos on Sunday, have only bolstered their standing. McDaniels' best work of 2016 came at the beginning, when he was preparing the offense to go the first four games without Tom Brady while the quarterback served his ``Deflategate'' suspension. Using backup quarterbacks, New England won the first three and scored 81 points. From there, the Patriots' offense has adjusted, as usual, amid a slew of injuries, including that to All-Pro tight end Rob Gronkowski. Patricia is being lauded for virtually revamping the defense on a near-weekly basis. He has dealt with personnel shuffling, including the offseason trade of Chandler Jones, the early suspension of Rob Ninkovich and the Jamie Collins trade in midseason, but has also managed to give his defense, devoid of big stars, completely new looks almost every week, depending on the opponent. The Patriots (12-2) enter the final two weeks of the season with the best record in the AFC. They won their eighth straight division title and have already guaranteed themselves a bye in the first week of the playoffs. Patricia and McDaniels would be available for interviews during that off week, if they choose. Last month, when the NFL Career Development Advisory Panel put out a preliminary list of head-coaching candidates, it left McDaniels off the list. That came in the wake of reports that the 40-year-old coach was more interested in replacing head coach Bill Belichick someday than starting over elsewhere. In an un-Patriots-like move, McDaniels went out of his way to say he'd love another crack at a head coaching job. Currently, there are openings in Los Angeles and Jacksonville. In his first shot at being a head coach, McDaniels started 6-0 in Denver, but was fired early in his second season after losing 17 of the next 22. Lowlights of his tenure included a videotaping scandal and his draft pick of Tim Tebow, one of many personnel moves that caused problems and ultimately didn't work out. "There are only 32 of those (jobs) in the world," he said. "They're opportunities that don't come along very often, and if you would ever be so fortunate and blessed to have another opportunity to do it ... it would be an opportunity that I would look forward to." His latest triumph, on a frigid day in Denver, was more the product of subtle tactics than any single huge stroke of brilliance. New England stayed patient with its running game, and though Brady threw for only 188 yards, the running backs gained 137. The Patriots didn't lose the ball and created three turnovers. "It makes you more difficult to defend when you don't have to force the ball to one thing or use one portion of the offense to move it," McDaniels said Monday. For the last two games on defense, the Patriots have figured out how to pressure the quarterback using only three or four rushers. Patricia is a master of bringing pressure from every angle. New England made Denver's offense one-dimensional in two ways: limiting the running game to 57 yards and taking Denver receiver Emmanuel Sanders almost completely out of the game (3 catches, 48 yards). The Patriots have allowed the fewest points (233) in the league. Asked about the defense's preparation on a short week, after a Monday win over Baltimore, safety Devon McCourty said: "You could tell. Guys were talking. Guys were communicating. We're trying to get to our (scout) offenses the best we can so when we get out here on Sunday we can just fly around, and I think that's what you saw out there today." McDaniels could have an edge in Los Angeles or Jacksonville because those teams might be looking for an offensive mind after years of being coached by former defensive coordinators. Patricia could be the hot candidate for any other job that comes open, given his uncanny ability to morph his defense from week to week. To hear Belichick tell it, any team would be fortunate to get either coach. "They should absolutely be on any head coaching list,'' he said recently. "I can't imagine that there are many other coaches that could present a resume equal or comparable to theirs. They've done a great job here for a sustained period of time, so a great track record. I personally think that a list of head-coaching candidates that didn't include them would be incomplete."